We know that the cloud is transforming the MSP business on an almost daily basis. The most common question asked is how to come up with the right strategy to take advantage of these opportunities and changes. 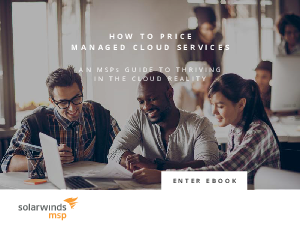 Take a look at our E-book “How to Price managed Cloud Services,” to discover how you can use the cloud to your advantage. Learn how you can use an a la carte pricing model to bundle more services and drive more value for your customers and for your business. You can add a personal touch for your customers that no other IT service provider can give them – support, service and help when they need it.